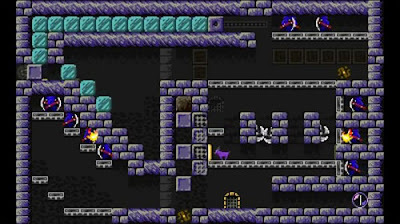 A game by MagicalTimeBean for PC and Xbox 360, originally released in 2011. 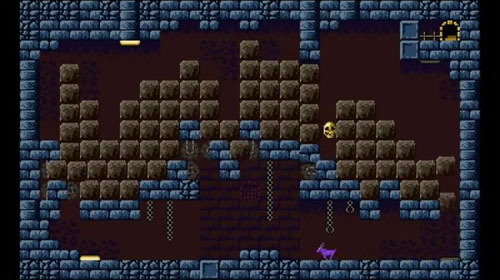 Escape Goat is a puzzle-platformer that stars an unlikely hero – namely a purple goat who has been imprisoned for the crime of witchcraft – and his unlikelier companion, a mouse that can run up walls. The duo must use their heads, literally and figuratively, to make their way through dozens of challenging single-screen dungeons on a quest to rescue a batch of fluffy sheep and escape the clutches of their captors. 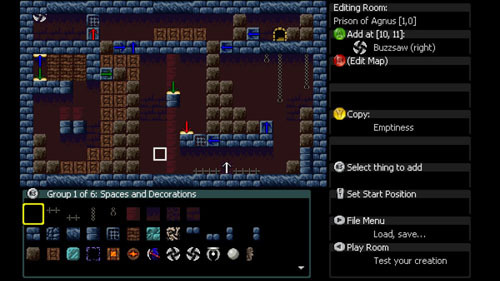 The bulk of the game focuses on puzzle solving and environmental navigation. As such, neither the goat nor the mouse are equipped with direct offensive capabilities. 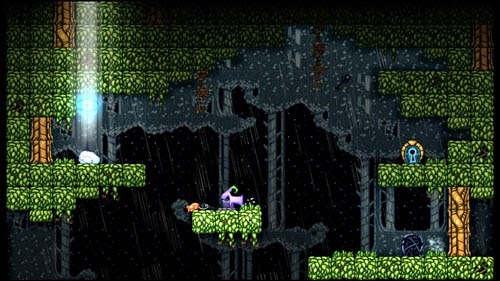 The goat can perform a ram maneuver, which causes him to move in a straight horizontal line. While this cannot be used against enemies, it can be used to break wooden objects and cross gaps. The goat also has a variable 2x jump and reaches 4x with a double jump. The mouse, on the other hand, has the unique ability to run straight up walls and across ceilings like a fully-equipped SOFIA 3rd from Blaster Master. The mouse can be summoned at will and automatically starts running in whichever direction the goat is facing, continuing along floors, walls, and ceilings until the goat calls him back, or until he is killed (which also returns him to the goat). The player has no direct control over the mouse, but mouse does behave differently based on how is placed. The goat can toss the mouse into the air to stick directly to a ceiling, or drop him downward to sit still and sleep. The mouse serves several functions. For one, a sleeping mouse can hold down buttons to activate things in the environment. Secondly, he can distract enemy Reapers and lure fireballs toward his position. 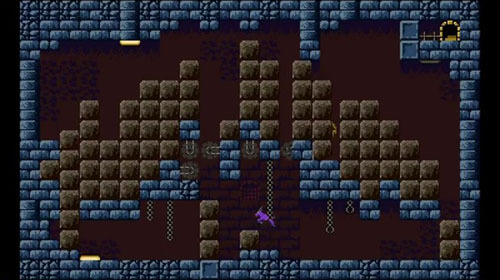 And finally, some levels contain a magical hat, which allows the goat to switch places with the mouse via teleportation and get into spaces that he could not reach on his own. 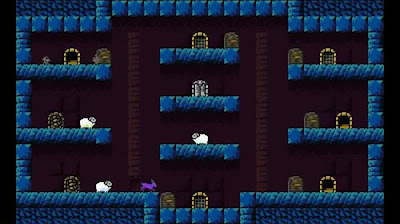 Since the mouse cannot collect any objects on his own, players must position the goat properly in order to collect keys to open the exit. 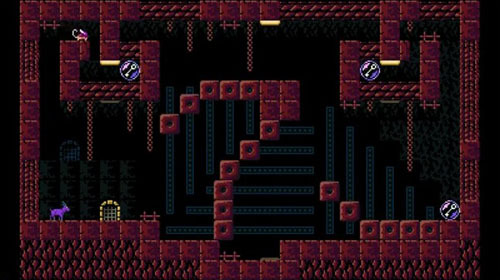 Most rooms require at least one key to activate the exit door, and many of the puzzles are focused on making your way to these keys, and then to the exit. But, despite the single-screen layouts, the rooms that you must navigate are far from static. 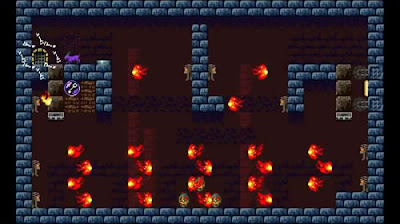 You must press switches, light torches, and lure enemy fireballs to make changes in the environment… sometimes changing the layout of the entire room with one simple movement. That’s one of the things that sets Escape Goat apart from the numerous other puzzle-platformers on the environment; rather than simply moving a block or two to open a new path, many of the environments are almost organic, with entire sections of blocks moving and sliding around to create new configurations like some gigantic Transformer made of rock. Rather than simply moving the blocks together as a whole, everything moves independently, creating gaps as the blocks speed up and slow down to come to rest in their new positions. Sometimes you’ll need to take these movements into account as you position yourself to get to another part of the room without getting crushed. 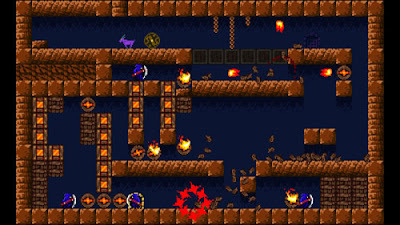 The game starts you out with a set of tutorial levels that quickly explore the basics of the goat’s movement, use of the mouse, and making changes to the environment. 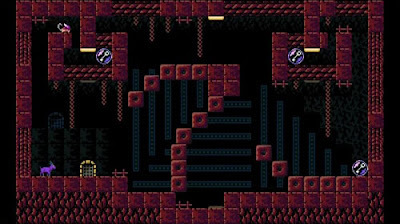 Then, you open up a hub level with doors leading to 8 more levels, but only 2 are available from the start. Each time you complete a level, 2 more open, allowing you to take on the levels in just about any order. There are 5 challenge rooms per level, plus a room with a sheep to be rescued. 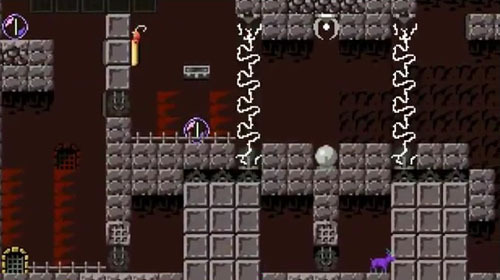 You’ll need to rescue 7 of the 9 available sheep in order to open the door to the final level. If you get stuck, you can always warp back to the hub, and you can pick up where you left off in any of the dungeon rooms. You can also instantly restart any room by holding down the handy suicide button in case you put yourself in an unwinnable situation. Individual challenges are short, however, so you’ll rarely lose much game time if you fail, and you’ll almost always learn something from your mistakes. 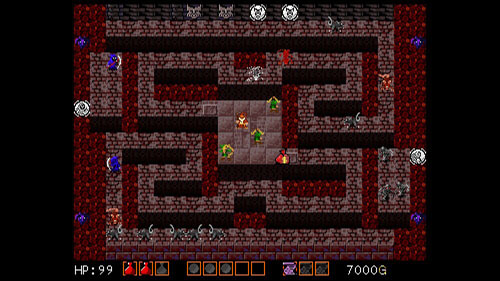 Each level has a different theme and its own set of challenges. 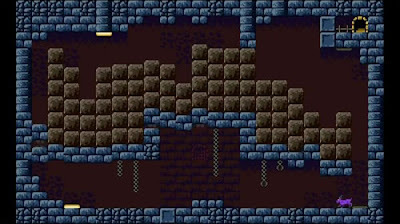 In the Frozen Caverns, you’ll encounter blocks of ice that cause you to slide when you run across them, and the mouse is unable to cross these blocks at all. The goat can ram ice blocks to push them along Pengo-style, sending them sliding along in one direction until they reach a wall and stop or fall off of a ledge. Figuring out proper ice block positions – and hitting them in the right order – is the key to solving many of the puzzles in this area. 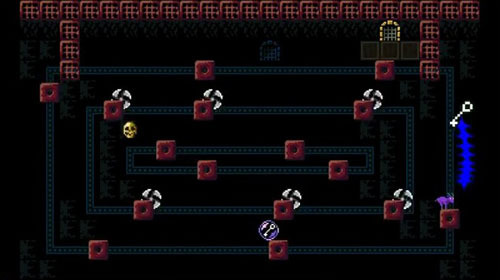 You’ll also have to contend with conveyor belts which can be overcome by dashing, and spinning saw blades that can crawl along walls and ceilings just like the mouse. In the Ruins of Red Clay, you’ll encounter Reapers who roam the levels and toss fireballs at the goat and mouse. The Reapers can only fire horizontally and they will only attack if they’re facing your direction at the time, similarly to the Reapers in Kid Icarus. 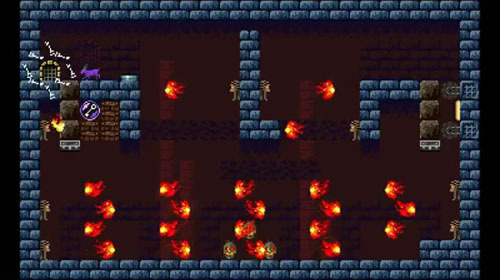 Many of the rooms are filled with wooden objects that can be destroyed by fire, and there are also powder kegs that can be ignited, setting off huge chain reactions that can destroy many objects, kill enemies, and kill you too if you’re not careful. The Darkest Pits will see you manipulating the movement of the Reapers to flip switches, and manipulating the paths of saw blades to do your dirty work for you. You’ll also be doing a lot of teleportation, even making some midair position swaps with the mouse. The Electrical Lab is filled with deadly electricity, requiring careful deactivation and reactivation in order to succeed. Failure in these levels usually results in death, so you’ll need to plan your switch flipping maneuvers accordingly. Electrical beams can also be broken if a block passes through them, allowing you use moving platforms to your advantage. The Crypt is filled with bone platforms that crumble when you run across them, and you have to be careful not fall into a pit that you cannot escape. 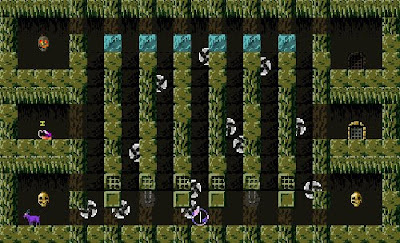 You’ll also need to position rocks to break bone platforms for you, once again being careful not to find yourself buried alive. The Lost City is filled with blocks. Some are the wooden ones you’re accustomed to, which can be broken by ramming them or warping through them. But some magical blocks appear as well. These blocks can obstruct other objects in the environment to be used for stacking, etc., but they have no effect on the goat or mouse. In the Engine of Insanity, your skills will be pitted against large complex machines, many of which are in motion from the second you enter the room. You’ll need to understand their workings, experiment with solutions, and move quickly before you are crushed into a goaty pulp. In the Limestone Quarry, you’ll face lots of switches needed to move blocks around the room. Here, you’ll not only need to get them in the right position, but also get your timing right to catch and carry them on moving platforms. Spinning saw blades return as well to keep you on your toes… er, hoofs. All of your hard work culminates in The Final Path, requiring you to use the knowledge you have gained on your journey, and requiring some creative use of your skills to find the puzzle solutions. 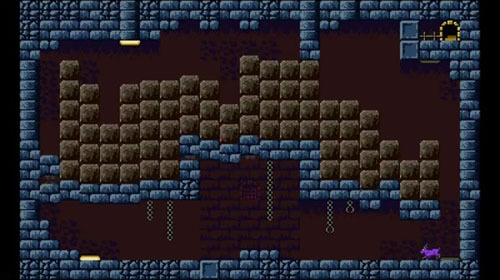 This final run has more rooms than the other levels, offering up more challenging combinations of the puzzle elements you’ve previously explored. 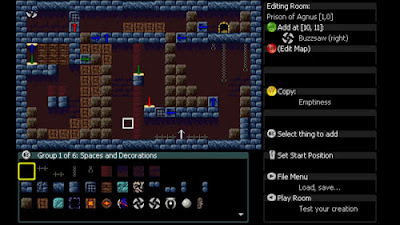 Once you’ve completed the main game (or beforehand if you’re an especially crafty one), you can try your hand at the level designer to create some dastardly rooms of your own. A full set of design tools is available, allowing you to concoct some constructions that would send Miner 2049er into fits. California-based MagicalTimeBean is essentially a one-man studio, operated by Ian Stocker. 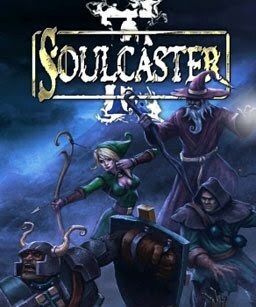 The studio was founded in 2009 when Ian began working on Soulcaster which was released on the Xbox Live Indie Games channel in 2010. 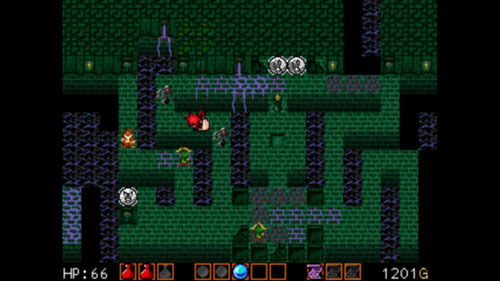 This was followed by a sequel, Soulcaster II, later in the same year, and both were released on PC in 2012. 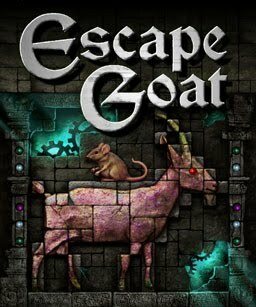 Following the release of Escape Goat, Ian released Escape Goat 2, a game that retains many of the same puzzle elements – while introducing a few new ones – presented with a higher resolution illustrative style with enhanced lighting effects, rather than the chunky retro style of the original. Prior to opening his own studio, Ian worked professionally in the game industry, working as a sound designer on a number of games for Nintendo handheld systems. His work includes the LEGO Star Wars games, Spore Creatures, 007: Everything or Nothing, Robots, The Sims 2, and several games in the Lord of the Rings and Harry Potter series. 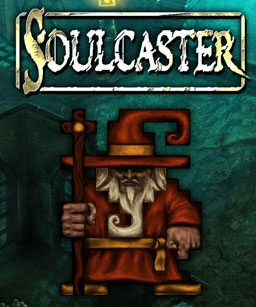 In Soulcaster, you play the part of a wizard who has no offensive abilities of his own. However, he does have the ability to cast spells which summon forth the souls of great warriors to protect him. There are three types of allies that can be summoned: a warrior, an archer, and an alchemist. 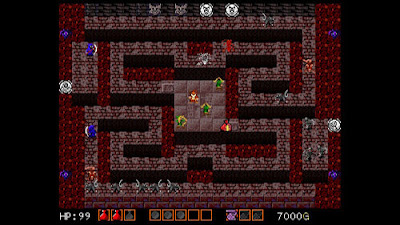 The wizard is able to run freely through the environment, but summoned warriors are stationary. 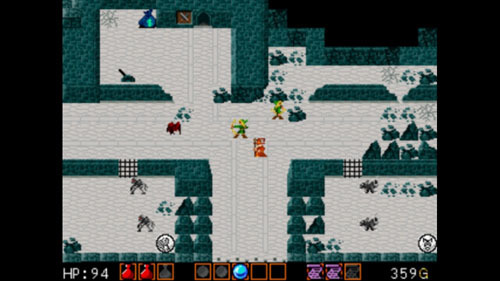 In this way, the game becomes a balance of RPG and tower defense, as the wizard must explore the environment but regularly encounters situations where he must surround himself with allies in order to survive. Each of the warriors has a different ability. 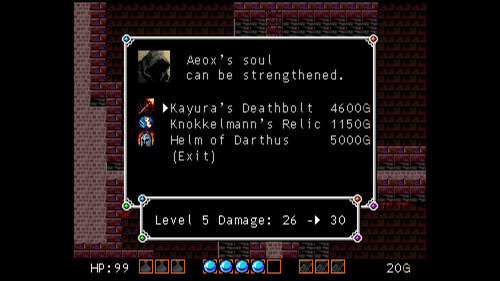 Aeox, the tough warrior, can slash enemies in adjacent squares. Shaedu, the archer, can fire her arrows long distances and take down enemies from afar. And Bloodfire, the alchemist, can toss bombs over walls, destroying enemies that neither of the other characters can reach. Players must employ strategy to take advantage of each of these abilities, such as placing warriors near choke points and using archers to fire across rivers. Each character’s weapons, attack speed, range, and health can be upgraded individually as well, allowing for a bit of customization. At the start of the game, you can only summon three warriors at a time (including multiples of the same type), but you can also spend your upgrade points to allow for additional warriors to be summoned, for a maximum of five. The wizard cannot defend himself directly, but he does have a couple of tools at his disposal that help to balance the lack of direct control over the stabbier members of his party. 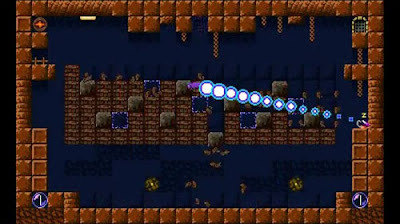 The wizard can carry potions to restore his health if he does come under direct attack, and he can carry scrolls that destroy all of the enemies on the screen. Both items can only be carried in limited quantities, which can be purchased from stores and sometimes found as enemy drops. 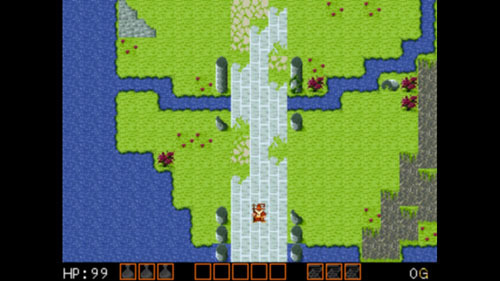 The same gameplay is present in Soulcaster II, with the three warriors making a return appearance. 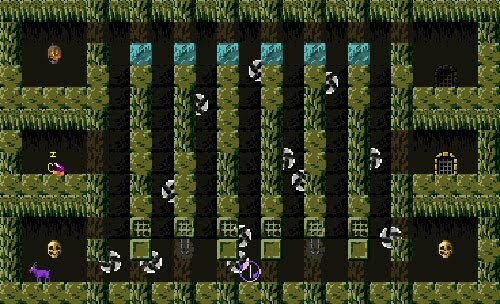 At the start of the game, the wizard can summon up to three warriors at a time, and you can upgrade to five. However, the environments are more detailed and visually diverse this time around. In addition, there switches that allow for entire sections of the environment to be altered, forcing players to consider the changing environment when deploying their troops. Traps can alter the environment as well, potentially blocking your path and forcing you to quickly adjust your strategy.